The Raps are supposed to outright win games like this. But the Raps were so sloppy in the first half that it didn't look like they would even have a chance to win tonight's game. The Pistons came out gunning and flat out dominated the Raptors in the first half. Toronto had 11 early turnovers midway through the second quarter while the Pistons had just one turnover as the Raps allowed 72 points by the half. This one started out ugly and most Raps fans had already changed the channel at that point. 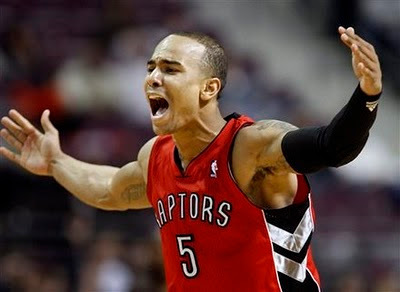 But the Raps turned it around and were led by Leandro Barbosa and Jerryd Bayless who charged the Raptors back into the game in the second half. I have no idea what Triano told the team at halftime (or if he was smashing chairs in the locker room) but the Raps did the unthinkable. Toronto made franchise history by erasing a 25-point lead to pull out the 120-116 win over Detroit. Jerryd Bayless did what he could to put the team on his back and finished with 31 points (10-12) (ties career high), he also went 10-12 from the line, grabbed 5 boards and had 7 dimes. Leandro Barbosa scored 11 of his 22 points in the final quarter. For the Pistons. Ben Wallace led the Pistons with 23 points (yes, Ben Wallace who averages 3 ppg), 14 boards, 5 steals and one three (yes, he even hit a three-pointer). Rodney Stuckey had the double double with 23 points and 12 dimes.